In mid-July 2020, Lindblad Expeditions sets sail from Tromsø to Alaska via the Northern Sea Route. “National Geographic Endurance roams free at the top of the world on the most untrammeled, adventurous route in the High Arctic on this epic voyage,” Lindblad Expeditions writes in the promotion of the voyage. In mid-August, the ship returns the same route back to Tromsø. 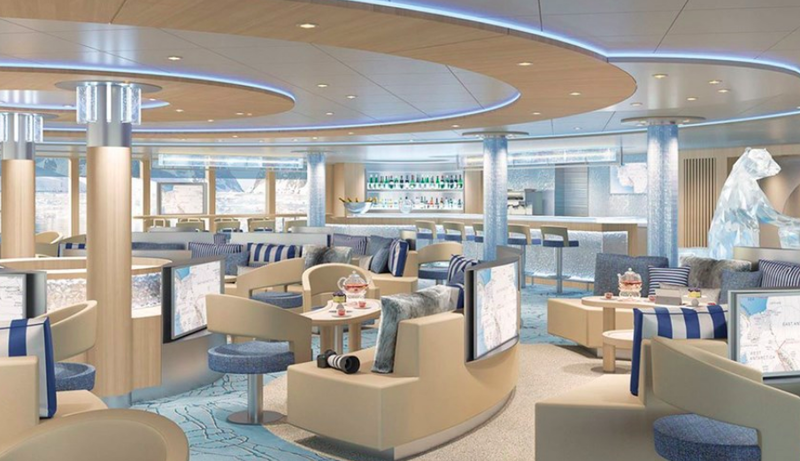 The lounge onboard “National Geographic Endurance”. The cruise vessel is designed as an icebreaker, holding ice-class Polar Code 5. The luxury cruise ship will, however, not be your only choice if you have some few tens of thousands of dollars to spend to sail north of Siberia. Silversea’s “Silver Explorer” will sail from Nome, Alaska in late August and arrive in Tromsø, Norway, in September. With a capacity of 144 passengers and a crew of 118, the ship will make stops at exotic Arctic archipelagos like Franz Josef Land, New Siberian Islands, and Wrangell Island, not least to talk about Novaya Zemlya, the mysterious Russian glacier-covered prolongation of the Ural Mountains. Both the “National Geographic Endurance” and “Silver Explorer” have exceptional comfort with cabins with private balconies. Restaurants, bars spa, sauna and fitness center are some of the luxury you will find inside. For landings on the Arctic beaches, the ships have Zodiacs, kayaks and specialists guides. It is just recently that foreign flagged ships with cruise passengers are allowed to make landings at the archipelagos northernmost islands, far north of the infamous nuclear test sites at the Matochkin Strait where underground nukes where tested between 1964 and 1990. A third polar adventure company to set sail for the Russian Arctic Northern Sea Route in 2020 is Quark Expedition. The ship “Ocean Adventurer” will not sail all east to Alaska but stay in the western part of the Northern Sea Route with stops at Franz Josef Land, Novaya Zemlya and – depending on ice conditions – at the remote Severnaya Zemlya. “This striking 22-day experience consists of breathtaking ice-draped coastlines rarely visited by tourists,” Quark Expeditions writes in the promotion of the itinerary for the voyages. Unlike Silversea and Lindblad Expeditions who starts the voyages in Tromsø and Nome, travellers with Quark Expeditions will embark in Murmansk, Russia, to where the passengers will fly with charter from Helsinki in Finland. Making post-calls to Murmansk in 2020 is also Hurtigruten, the largest of all cruise liners to sail Arctic waters. 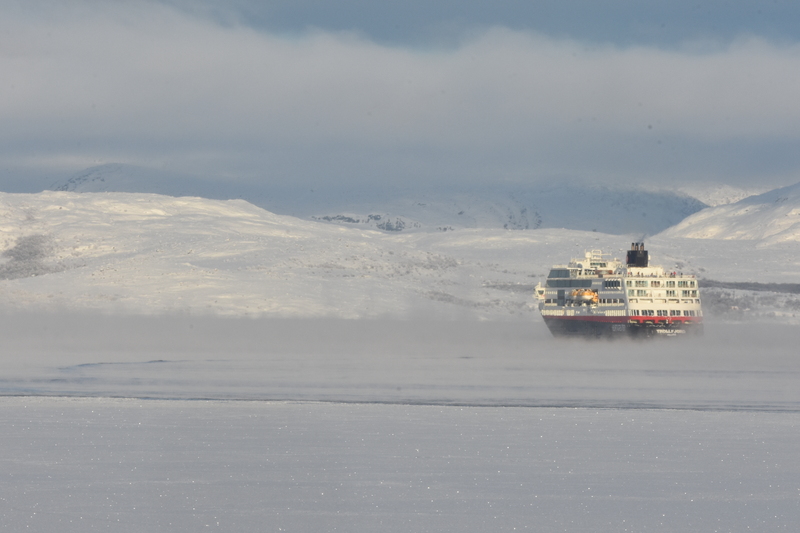 Hurtigruten’s ship “Spitsbergen” sails to Franz Josef Land two times in September next year. The cruise liner has no itineraries for the Northern Sea Route listed for its expedition program for 2020 and 2021. Rune Thomas Ege, VP Global Communications with Hurtigruten, though, will not rule out possible future voyages further east in the Russian Arctic. Meanwhile, Hurtigruten recently announced voyages along the Northwest Passage, sailing the icy waters via Greenland to the north coast of Canada. “We have ambitions for further growth, also in the direction of Asia. Time will show which route we will take when we are sailing that way,” Rune Thomas Ege chuckles.